Bandung city increasingly establish itself as a tourist city. After the last Cicendo square was unveiled during the new year, yesterday, Kang Emil (Mayor of Bandung) announced that Forest Walk Babakan Siliwangi has finished construction. Now you can come back to play at Babakan Siliwangi and take a stroll in the Babakan Siliwangi Forest Walk. Wargi Bandung will feel the sensation of walking in the middle of the forest with a height of 3-4 meters from the ground. Forest walk is the longest in Asean with a length of 2.2 km. Forest Walk Babakan Siliwangi this could be an alternative tourism that already saturated with urban hustle and bustle. Although located in the middle of the city, but Wargi Bandung will feel the green scenery of the trees and fresh air here. 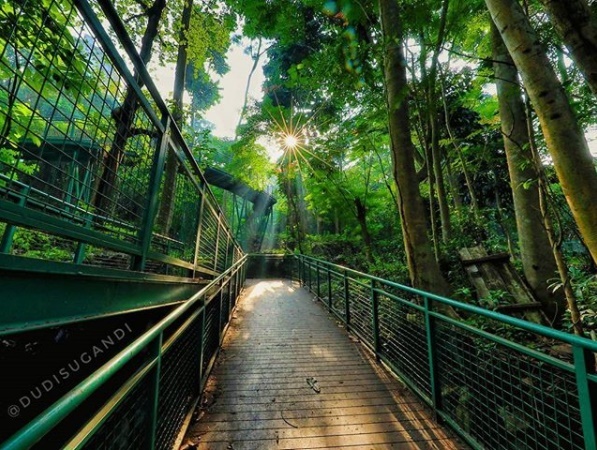 Babakan Siliwangi is a 3.8 acre urban forest in Bandung, Indonesia It is part of the green belt of Bandung and is a recreation place for the locals there. On September 27, 2011, the United Nations certified Babakan Siliwangi as a world urban forest. This place is free, you only need to pay for parking in Babakan Siliwangi area if you bring a vehicle.